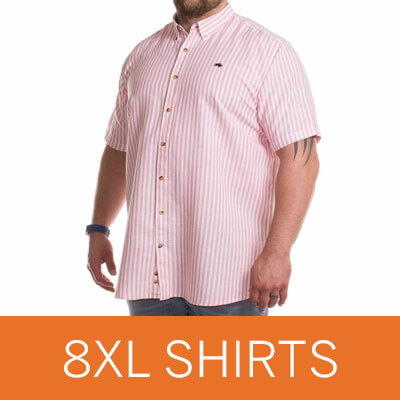 At Big Dude, we stock men’s clothes up to 8XL, but don’t worry – our 8XL sizes are always being improved and we always aim to have a fantastic selection of clothing in 8XL to suit all tastes and budgets. If you are looking for trousers or jeans, you’re probably looking at a waist size of about 68-70-inches but it is really important to measure yourself and use the sizing guide for the best fit. 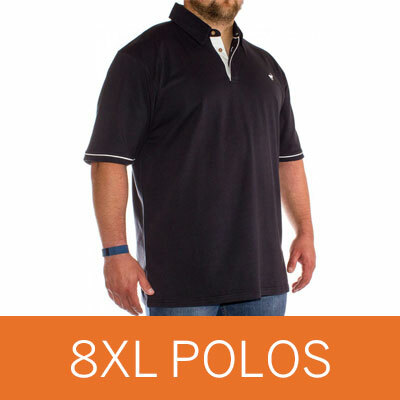 Our most popular 8XL clothing is from Duke. We find that they make excellent shirts and hoodies, all at very reasonable prices. Most of the shirts we have available at Big Dude go up to size 8XL so we have loads of shirts for you to choose from in a variety of different styles and colours. Brooklyn, Cotton Valley and Espionage brands stock the biggest range of 8XL shirts, so we would recommend starting there. Whether you are off to a BBQ, visiting the pub or heading off to work, we stock both formal and casual shirts so no matter the occasion, we have you covered. 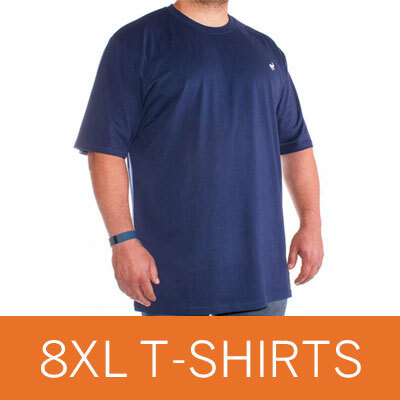 At Big Dude, we also have men’s T-shirts in size 8XL. Varying from plain to patterned tops with crew neck and V-neck styles, we also have a mix of different fabric tees with our cotton T-shirts always being the most popular. Our polo shirts are always really popular and a staple piece in most men’s wardrobes. Easily dressed up or down and perfect for most occasions whilst being cool and comfortable, we can see why people like them! Our polo shirts are a mix of bright, plain, colourful and detailed pieces, so whatever you are after, we have a polo shirt for you. Our 8XL jackets and coats are both stylish and practical. Whether you are looking for a light rain mac, a hooded and warm winter coat or simply a fleece, we have a wide range of jackets for you to take a look through. Keep an eye out for new items at the change of seasons and as always, enjoy fantastic Big Dude offers and grab a great deal on your new 8XL jacket. XXXXXXXXL Hoodies & Jumpers - See all 8XL hoodies now. We stock a wide range of 8XL hoodies and jumpers at Big Dude. Whatever colour, style or fit you are looking for, our huge range ensures we will have it in stock. Our zipped hoodies are a really popular 8XL item as they are really easy to put on, perfect for layering over a T-shirt and overall just a really easy item to wear. Take a look at the whole range of 8XL shorts online at Big Dude and update your warm weather wardrobe! Big Dude have cargo shorts, swim shorts and casual shorts available so whether you are looking for a bright pair with a flashy design or prefer plain shorts, we have both available. With brands such as Big Dude, D555, Espionage and Metaphor available, you can be confident that you will be buying fantastic quality items and look great at the pool or beach too!